Alberta has vast petroleum hydrocarbon reserves, and thousands of producing oil and gas wells throughout the province. A byproduct of this production is wastewater brines, which contain considerable concentrations of valuable metals, including lithium. Lithium is traditionally used in the manufacture of glass, ceramics, and lubricants, and increasingly in lithium ion batteries (LIB). With the continued growth of the LIB market, the extraction of lithium from oilfield brines is a potentially promising new industry in Alberta. The Alessi group is collaborating with E3 Metals Corporation, based in Calgary, Alberta, to develop novel methods of extracting lithium from brines that can exceed 200,000 parts per million in total dissolved solids. The research, funded by E3 and a grant from the Natural Sciences and Engineering Research Council of Canada, has already shown promising results. A novel metal oxide sorbent is routinely yielding >95% extraction efficiency, with little co-extraction of other metals. Within the next 12 months, the first pilot demonstration plant in Alberta will be developed based on the research results of the collaboration. 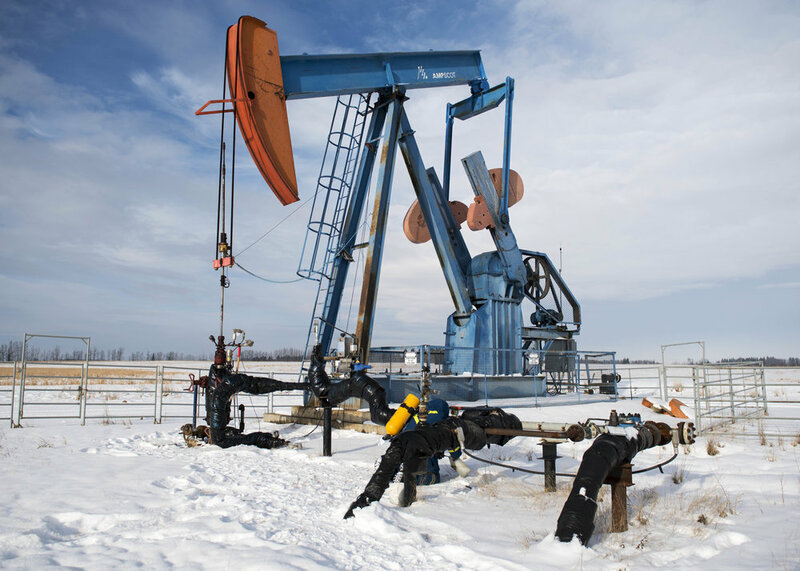 Hydraulic fracturing combined with horizontal drilling to liberate tight natural gas reserves is relatively new technology that is a growing component of the energy sector in western Canada. Annually, millions of cubic meters of flowback water, a mixture of fracturing fluids and formation water, return to the surface following fracturing. The flowback waters must be appropriately treated before reuse or disposal. However, the unknown variability in the chemistry, toxicology, and microbiology pose challenges to its treatment, recycling, or partial re-use. With an interdisciplinary team from the University of Alberta and in partnership with Encana Corporation, we are conducting a comprehensive investigation of the chemistry, toxicology, and microbiology of flowback and produced water from the Duvernay and Montney Formations in Alberta. We are (1) evaluating the organic and inorganic chemistry of flowback and produced waters and its links to toxicity, (2) assessing the sources of microbial biofouling and biocorrosion in fluids associated with hydraulic fracturing, and (3) modelling the transport and fate of fracturing chemicals in geologic media. With this research, we aim to develop new tools to characterize fluids in the hydraulic fracturing water cycle, inform risk management plans for wastewater handling and transportation, and produce leading science that will support reduced water use and improved costs for hydraulic fracturing operations. Biochar is essentially charcoal - a solid byproduct created by the heating wastes as by-product (farming, oil and gas production, etc.) in an oxygen-limited environment. As a stable, high surface area, carbon-rich product, they can be effective in the removal of a wide range organics and metals, including chlorinated ethenes, PAHs, and other hydrophobic organic contaminants, from water. Biochar can also sequester carbon dioxide and provide nutrients to soil. Our work investigates the sorptive capacity of biochar to remove organic acids and reductively immobilizing metals from oil sands process-affected water and in agricultural settings. Reductive immobilization is a promising remediation strategy for the removal of certain redox-active metals from groundwater, and we are particularly interested in identifying and understanding the long-term stability of immobilized and precipitated solids that form following metal reduction. We are also exploring the potential to extract carbon nanoparticles from biochar that may replace more costly materials in certain applications. 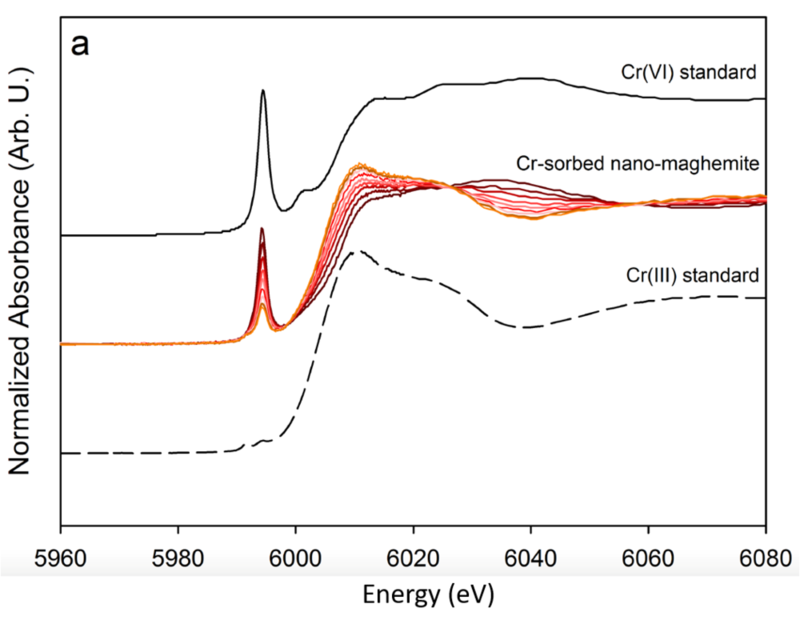 X-ray absorption spectra showing the redox tranformation of Cr(VI) on nanomaghemite (Komárek et al., 2015). Iron-bearing minerals can control the adsorption, precipitation, and redox transformations of trace metals in aquifers, soils, and the ocean. In many environments, nanoparticulate iron phases form as precursors to well-ordered minerals, which may be far more soluble and reactive toward trace metals. We are exploring the thermodynamics and reactivity of freshly-precipitated green rusts, solid phases important in both reducing terrestrial environments and in the chemistry of the early oceans. In a second line of research, we are exploring the doping of biochar with iron to increase its electrical conductivity, thereby enhancing its ability to immobilize certain redox-active metals, such as hexavalent chromium in contaminated waters. In collaboration with AREVA Canada, we are studying the speciation and cycling of uranium at the Cluff Lake mine, located in northwestern Saskatchewan. The mine was an active uranium mine from 1980-2002. Active decommissioning of the mine began in 2004, and this included backfilling the open pit, covering the area with soil, and replanting trees and shrubs. As part of a long-term monitoring program, we are working determine the legacy impact of uranium mining on the environment. Our objective is determine the sources of uranium contamination (proportion in the soil and water) and the cycling and transport of uranium through the ecosystem (groundwater and vegetation). Through this work, we aim to better predict what future risks could come from this site and provide pathways for improved remediation.